On Sunday we remembered the terrible cost in loss of human life and suffering in the wars over the past 100 years. We gave thanks for the freedom we have to live our lives. At just about every level we see conflict in the world. As I write this there is bitter dispute between prison officers and the government over conditions in our prisons. 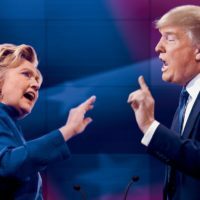 Whatever you thought of the recent US presidential elections the bitter, personal and acrimonious exchanges between the candidates which Robert Peston described as the ‘dirtiest most depressing campaign in human history’ was hardly a model for how to address and debate difference of opinion! If Clinton and Trump were a married couple they would have divorced long ago. But is all conflict a bad thing? In particular is the conflict in your life and relationships always a bad thing to be avoided and mitigated at all costs? In his book “Marriage Matters’ Winston Smith puts marital conflict in this wider context of the conflict in the world and ultimately the conflict between Jesus and Satan that begun when Adam and Eve fell. He suggests we can see conflict in a fallen world as a good thing. He says “Conflict, far from being a sign of moral or marital failure, is God’s chosen means of rescuing his people and destroying sin.” Now that sounds encouraging but you may have to read the detail in the book to be convinced of that! Proverbs 17 vs. 14 says ‘Starting a quarrel is like breaching a dam; so drop the matter before a dispute breaks out. There are many times in my marriage when after a bitter argument I have though ‘Oh I really wish I had just kept quiet and not raised the matter’. Yielding is not the same as just giving in for a quiet life or pretending there is not a conflict. We need to ask ourselves Is this the wrong time to be confronting this issue? Do I need to lovingly wait for the right time. Remember God himself is patient with us. So often we can weigh in with our views and create a storm when if we waited patiently for the right time things would be very different. Sometimes stepping back from a conflict is wrong. Sometimes confronting is right thing. Confronting is not the same as winning but involves moving lovingly towards the other person to confront. When I yield I am showing the forgiveness in Christ that covers not ignores our sin; when I wait I am showing the patience of God and when I do confront it is not to defeat the person but to deal with the sin in me and in them. One or both of us needs to repent. One or both needs forgiveness. Ultimately I can only willingly do this because of Christ. So if you find conflict in your relationships at home, in the work place or in your church relationships don’t be discouraged or just try and pretend it’s not there. Keep the three approaches mentioned above (yield, wait, confront) and pray for wisdom to apply them in your conflicts. The subject of marital conflict is dealt with in much greater detail and very helpfully in the book Marriage Matters by Winston Smith which most of the above ideas come from. Hmmm. I can identify with that trilogy of responses. The difficult bit is to know which to apply when. Would it be wise to apply them mostly in the sequence dealt with in the article? Usually yield. Sometimes wait. Hardly ever confront. I would like to know what other people think. Responding to Robert’s post I find that my own tendency is to try to appease and to avoid a confrontation which involves conflict. But conflict in marriage can sometimes be God’s means of us growing and learning. On the other hand yielding can often require self-sacrifice and deferring my rights which I also find a challenge! Winston Smith in his book deals with conflict in marriage in much more detail and more wisely than my brief article which just highlights the three responses. He does also show that each response can be right in its place but also give three common ways we can react wrongly to conflict (key words appease, ignore and win). Graham has helpfully pointed out that Christ is our pattern and example in all this.